Back home tonight, and I wanted to get a picture of Milwaukee before the end of the day. Here's a shot of the Mitchell Gallery of Flight in the common area of the terminal at Mitchell Field. 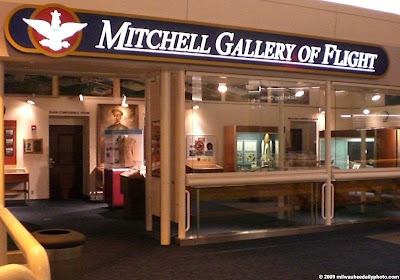 The gallery contains information about General Mitchell, the airport that bears his name, and connections between the city, state, and the aviation industry. It's not very large, but there's a lot of great exhibits. If you've got some time to kill at the airport, consider this free option. I was anxious to see how your trip to Phoenix went and it looks like you had a great time. Spring Training, the Apache Trail and Chihuly. A lot to pack in during a short time but the weather was excellent for you. Welcome back to Milwaukee and I am glad you have been enjoying the photos of Chihuly and Scottsdale on my site.